Supplemental examination in biology and environmental sciences is required before admission to the study programme if this subject was not completed satisfactorily with at least 6 credit hours at a higher-level secondary school ("Oberstufe"). VO Basic Zoology: Organisation and Diversity of Animals I (CM 2 lit. c/2 hrs. /3 ECTS-Credits). (2) Successful passing of all exams of the Studies Induction and Orientation Period entitles to passing all further courses and examinations and for writing the Bachelor’s Thesis. (3) Before successful completion of the Studies Induction and Orientation Period courses amounting to 21 ECTS-Credits may be passed. The registration requirements listed in the curriculum must be adhered to. The Studies Induction and Orientation Stage (STEOP) requirements cease to be effective as of academic year 2014/2015 and no longer apply for students of this study programme. Students who enrolled for this programme before 1 October 2014 (academic year 2014/2015) can repeat not successful completed courses which were designated in the curriculum as “STEOP courses” four times (= five examination attempts). As per Universities Act § 77 (2), previous attempts are to be counted among the number of total examination attempts permitted. (1) The Studies Induction and Orientation Stage (STEOP), with a duration of one ts), provides an overview of the study programme and its structure in order to give students an objective basis to assess their decision to pursue their chosen subject(s). 3. VO Basic Zoology: Organisation and diversity of animals I (CM 2 lit. 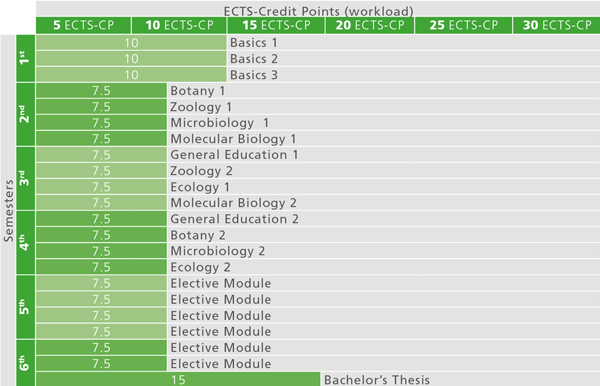 c/2 h/3 ECTS-Credits). (3) A positive result (passing grade) on the examinations specified in Paragraph 2 permits students to attend all courses and take all examinations following the Studies Induction and Orientation Stage (STEOP) and to write a bachelor's thesis as described in the curriculum. The registration requirements specified by the curriculum must be met. The Bachelor's Programme Biology, incorporating the fundamentals of the natural sciences (chemistry, biochemistry, physics) and general abilities (multidisciplinary skills, laboratory methods, field methods, experimental design, statistics), offers wide-ranging instruction in the individual branches of biology (botany, zoology, microbiology, ecology and molecular biology). The modules convey both theoretical knowledge, based on extensive laboratory and field experience, and necessary practical skills. Students are made familiar with scientific writing and research and are able to develop problem-solving skills. Individual specialization may be pursued through the selection of specific elective modules from the branches of biology, allowing students to adapt their programme to meet individual occupational goals. Graduates are able to elaborate, evaluate, assess and implement scientific developments in the fields of biology and to apply them in interdisciplinary contexts. They possess theoretical and methodological problem-solving skills as well as multidisciplinary skills, such as learning strategies, literature research and information retrieval, and scientific communication. The Bachelor's Programme Biology specifically prepares students for activities in private and public institutions in the fields of agriculture and forestry, environment and nature conservation, landscape planning and management, pharmaceutics, medicine, public administration, museums and libraries, botanical and zoological gardens, and nature reserves.